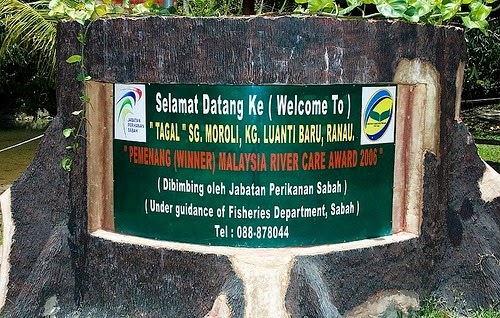 131 kilometers away from Kota Kinabalu is the Tagal Sungai Moroli in Kampung Luanti. If you like something other than your average spa, Kampung Luanti is where you should go. Here, you will have the opportunity to try the fish massage. This fish massage is deemed to have heal or curative effect on those who suffer from psoriasis. The word 'tagal' in the local kadazan-dusun dialect means 'no fishing'. The main purpose of 'tagal' is to preserve the environment as well as the ecosystem of the river for the benefit of the next generations. The Malaysian Mahseer or the Pelian fish originates from the family of Cyprinidae. It is said that these fishes are specifically trained by the villagers here at Kampung Luanti to perform the healing massage on the visitors. Other than this ticklish fish nibbling activity which helps remove the dead skin from your feet, there are also number of activities to be done here. You can also choose to walk in the jungle or camp here at Kampung Luanti. If you wish to extend your stay at Kampung Luanti, there is homestay program that you can join to learn more about the ways of life of the villagers here in Kampung Luanti and also to relax. With so many attractions here in the Land below the Wind, there is no reason why you should not continue your stay here. Sabah is the place to go if you like everything natural. The beautiful scenery and untouched jungles and beaches are simply to die for. Accommodations in Sabah are many and do not worry about not finding a place to stay. There are many to choose from based on your budget and convenience. To get there from Kota Kinabalu, just drive in the direction to Kota Belud (KB) town. After an hour, you will reach a roundabout, just follow the brown signage color that says 'Jeti ke Pulau Mantanani' (Jetty to Mantanani Island). Then you will see second roundabout (Kuala Abai), follow the junction at the left, and you will arrive the entrance of Usukan Cove Lodge within 10 minutes.